The ClearStream Micron-XG antenna uses patented technology to receive TV signals 35 miles away from broadcast towers. Designed with a stylish texture finish to blend into sophisticated spaces, the Micron-XG is ideal for urban and suburban areas. The 20 dB in-line amplifier provides signal amplification without adding artifacts, while offering maximum signal reception to noise ratio for efficient tuning. The result is a clean signal. 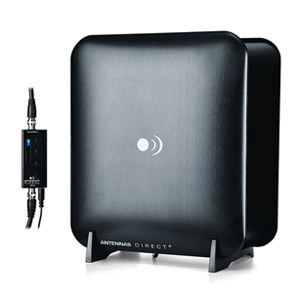 No other antenna can match its performance in such a compact form. Locate the broadcast towers serving your area at the official website. Place indoors next to your TV or on a shelf. Connect the high-performance coaxial cable into the back of your TV. Scan for the available channels using your TV remote control. Try several locations to find the best reception and remember to scan for channels at each location. Enjoy all your favorite local and network shows in Full HD 1080 where available. You can now experience HDTV in the highest quality picture and sound available. Over-the-air broadcasts are transmitted in crystal clear Full HD 1080; far less compressed than what cable and satellite offer. Many local broadcasts are digitally aired in 5.1 Surround Sound giving you the ultimate sound stage for watching live television. With a digital antenna you can receive free local news, weather, kids shows, sports, cooking, shopping, and sitcoms from networks like ABC, NBC, CBS, FOX, PBS, CW, ION, and much more with no cost or contracts. And broadcast TV won't be interrupted from service drop outs (ehemm satellite). Quick fact: local sports are broadcast free over-the-air. You just need an antenna. Product Dimensions: 10"L x 11"W x 4.5"